In a previous question I asked how stationary bits could be processed by logic gates. I casually mentioned that I could visualize qubits traversing stationary logic gates, and @DaftWullie said “It might help if you explain how you're visualising the flying qubit”, and I said to myself “Oops, I probably don’t have that right at at all!”. I simply visualize Bloch spheres moving in some constrained way from gate to gate, changing their vector angle according to the logic of the gate, with communication between the gates as programmed (like IBM Q makes it appear). If you can correct that image, maybe it would help me understand how stationary qubits (with moving gates?) work as well. 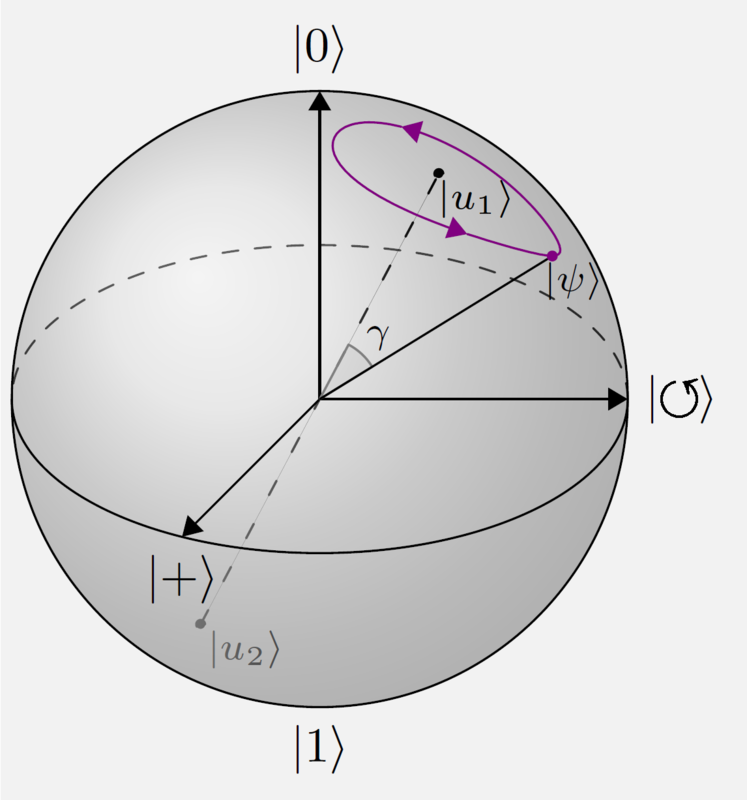 Bloch spheres are a reasonable visualisation of individual qubits, so long as you don't fall in to the trap of thinking that's what they actually, physically look like. It's just a convenient mathematical mapping from a parametrisation of the state into a pretty picture. And it doesn't work so well once entanglement between multiple qubits comes into play. While you are thinking about Bloch spheres, one can then think about what a single qubit unitary is and does. The unitary basically defines an axis through the sphere, and an angle of rotation. For any given state, and a fixed axis, there's basically an orbit that the state could map to (because unitaries preserve inner product, so the angle between the state and the axis must remain fixed), and the angle is just how far around that orbit the state is moved. Now, how might you think about physically implementing this. You need some sort of apparatus that fixes what the direction of the axis is. This is usually some sort of electro-magnetic field. The angle of rotation is essentially determined by how long the qubit is in that field. For flying qubits, you can therefore think about setting up a region of a particular size in which this field is active. If you know how fast your qubit is travelling, you know how long it's in the field for, and that determines its angle of rotation (up to caveats about Heisenberg uncertainty principle). But equally, you could just have the qubit sitting in one place, and simply switch on the field for the right length of time. Indeed, these two solutions are practically the same. Just think about your flying qubit situation from the reference frame of the qubit. In that frame, the qubit is stationary, and it is the field that moves towards it. In terms of something slightly more concrete and physical for the stationary qubits, the direction of the axis of the unitary can often be determined by a couple of lasers. So, you have a couple of lasers that can be shined at each qubit, and you just switch them on and off at the right moments in time, with the correct relative strengths. Not the answer you're looking for? Browse other questions tagged programming bloch-sphere or ask your own question. How to obtain Y rotation with only X and Z rotations gates?